Genuine 22nd Century Swimbait Triple Trout Replacement Tails. 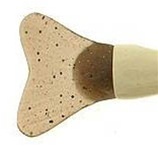 6" bait tails are 1/2" Dia at the base where it attaches to the lure and 1.25" wide edge to edge on the fin rays. 7" bait tails are 5/8" Dia at the base where it attaches to the lure and 1.75" wide edge to edge on the fin rays.